UCLR Announces 2019 Awardees for its 26th Annual Cesar Chavez Awards Dinner. Amid the ongoing political battle over the border wall, denials of asylum seekers at ports of entry, and the continued family separations at the border, Utah’s longest-serving Latino civil rights organization will take an evening to honor local Latino leaders whose works, advocacy and service have advanced Utah’s Latino community. Salt Lake City, March 20, 2019 – Utah Coalition of La Raza (UCLR) has announced its winners of the 2019 Cesar Chavez Peace & Justice Awards and its Robert “Archie” Archuleta Lifetime Achievement Award, the latter of which was named in honor of the lifelong community activist who died earlier this year. UCLR has selected two local Latino leaders and a fellow nonprofit to receive the Cesar Chavez Peace & Justice Award this year: Olga De La Cruz, Ray Betancourt, and the Suazo Business Center. Additionally, UCLR will award the Robert “Archie” Archuleta Lifetime Achievement Award to longtime community advocate and organizer, Beatrice Sanchez. This year marks the 26th Cesar Chavez Peace & Justice Awards Banquet, which will be held on March 29 at the Union Event Center (235 North 500 West, Salt Lake City) from 6pm-9pm. Details about UCLR, the event, and awardees can be found at uclr.org and press passes will be available. UCLR opens nominations and ticket sales for its 26th Annual Cesar Chavez Peace & Justice Awards Banquet. UCLR ANNOUNCES THE 2018 CESAR CHAVEZ PEACE & JUSTICE AWARDEES. UCLR | Utah Coalition of La Raza announced this year's Cesar Chavez Peace & Justice Awards will be presented to Utah State University Professor Crescencio López-González, nonprofit Comunidades Unidas, and Utah State Rep. Angela Romero. UCLR will also present the Lifetime Achievement Award to Andrew "Andy" Lalo Gallegos. UCLR will present the awards at its 25th Annual Cesar Chavez Peace & Justice Awards Banquet on Saturday March 24, 2018. Tickets are still available so you can join UCLR as we honor these community leaders. Information about the awardees is listed below along with past awardees. UCLR honors the lifelong contributions of Andrew “Andy” L. Gallegos and his many years of leadership, service, and advocacy in the Latino community. The hallmark of Andy’s life has been his commitment to “opening the doors” to the Latino community in the areas of education, health, and employment. Born in Cuba, New Mexico in 1940, Andy’s family moved to Salt Lake City’s Rose Park neighborhood when he was a child. Andy was elected as West High School’s first Hispanic student body president in 1958, showing leadership at an early age. After serving with U.S. Army Intelligence in Panama from 1963-1965, Andy returned to Utah and graduated with honors from the University of Utah with a master’s degree in human resource management. During the 1970s, Andy was heavily involved in community service and organizing. As Board President of Utah Catholic Community Services, Andy led the fundraising efforts to build a new St. Vincent’s de Paul Dining Hall. Along with several leaders in the community, Andy formed the first statewide Chicano Conference in 1972. Andy was instrumental in creating the Institute of Human Resource Development, which would become Centro de la Familia. He also served as Director of the Utah Community Action Program, where he oversaw the implementation of several programs for the poor. Active in politics, Andy helped form the Utah State Hispanic Democratic Caucus. Andy was even part of the team that brought Cesar Chavez to Utah in 1979. In 1982, Andy served as part of a U.S. delegation to the Philippines to assist in the resettlement of over 1 million refugees in southeast Asia. After returning home, Andy was appointed as Executive Director of the Utah Department of Social Services under Governor Scott Matheson and was the first Latino to serve in a Utah governor’s cabinet. In the private sector, Andy assisted more than 400 minority businesses as a consultant and served as Marketing Manager for the Utah Transit Authority. Today, Andy enjoys retirement with his loving wife Joan and daughters Audrey and Sarah. UCLR honors Crescencio López-González for his work and impact ensuring Latinx inclusion at Utah State University and Logan area. Crescencio López-González is an Assistant Professor of Latinx Studies at Utah State University. Professor López-González came to the United States as a young teenager from Guerrero, Mexico, and worked his way through school in California’s agricultural fields. As a graduate from the University of California, Davis and the University of Arizona, both of which are land-grant institutions, he firmly believes in the land-grant mission of bringing research-based knowledge to undergraduate students. Under his guidance, 58 students have presented their research at local, state, national and international conferences. Outside of the classroom, Professor López-González has advised and mentored USU’s Spanish Club, Latinx Student Union, Latinx Creative Society and the Aggie Dreamers United. Moreover, he has become a community advisor to the Latino Logan Library Council, the Logan City Public Library, the North Logan Public Library, the USU Cache County Extension, the Cache Makers 4-H Club, and the Logan Block Film and Art Festival. He also helped start the Hispanic Heritage Festival at the library and the “Day of the Dead Procession” at USU, both of which have become successful traditions for the past few years. Crescencio lives in Logan with his wife and three daughters. UCLR honors Comunidades Unidas | Communities United (CU) for their years of service and impact for Utah’s Latino community. CU is a community-based nonprofit organization with the mission to empower Latinxs to recognize and achieve their own potential and be a positive force for change in the larger community. CU’s vision is that every Latinx in Utah becomes healthy, self-sufficient, and an active member of the community. Founded in 1999 by a group of Latina women, CU has emerged at the forefront of the immigrant rights movement in Utah and currently provides direct services to more than 5,000 individuals each year while maintaining its grassroots connection with Utah’s Latinx community. Access to Healthcare: Health insurance enrollment, outreach and education about relevant health issues, connection to primary care, and free health screenings. Immigration Services: Citizenship, family petitions, and Deferred Action for Childhood Arrivals (DACA). Civic Engagement: Leadership trainings, voter registration, and immigrant rights organizing and advocacy. UCLR honors Utah State Representative Angela Romero for her inspiring leadership, longtime community work, and effective advocacy in public service. Rep. Romero was first elected to the Utah State House of Representatives in 2012 and re-elected in 2014 and 2016. Raised in Tooele, Utah, Angela moved to Salt Lake City as she attended the University of Utah where she earned her bachelor’s degree in political science and, later, her master’s degree in public administration. While an undergrad, Angela served on the Chicano Student Association where she began working with Latino community leaders such as Archie Archuleta, Pete Suazo, and Ross Romero. Angela was a founding member of UCLR as a student representative and served on UCLR’s board from 1992 to 2015. Professionally, Angela has worked for Salt Lake City since 2001 and currently serves as Community Programs Manager for the city’s Division of Youth and Family Programs. Angela continues to serve the community not only through her career and legislative roles, but also through various boards, commissions, and work groups. At the state legislature, Rep. Romero has passionately championed issues that include: victim’s rights, sexual assault and domestic violence prevention, and clean energy initiatives. Her leadership has even attracted national attention as she was recently elected First Vice President of the National Hispanic Caucus of State Legislators. With a heavy workload, Angela still finds time to be active and involved with St. Patrick’s Catholic Church and in her community. She also savors any time she can spend with her family. UCLR Announces 2018 Awardees for its 25th Annual Cesar Chavez Awards Dinner. Amid great uncertainty surrounding DACA and immigration policy, Utah’s longest-serving Latino civil rights organization honors 25 years of advocacy and service, honoring local Latino leaders. Salt Lake City, March 5, 2018 – Today, Utah Coalition of La Raza (UCLR) released the names of those it will honor at its annual awards dinner for their contributions in making a positive impact for Utah’s Latino community. 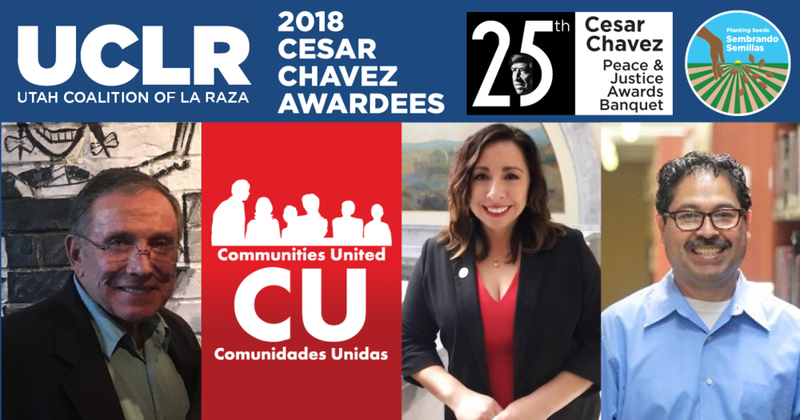 UCLR has selected two local Latino leaders and a fellow nonprofit to receive its Cesar Chavez Peace & Justice Award: State Representative Angela Romero (D-Salt Lake City), Utah State University assistant professor Crescencio López-González, and Comunidades Unidas. Additionally, UCLR presents a lifetime achievement award, which will be given to longtime community organizer Andrew Lalo Gallegos. In years past, UCLR has recognized a wide range of leaders, such as DREAM Act sponsor U.S. Senator Orrin Hatch, and organizations, such as The Utah Compact and its organizers. UCLR has also awarded various advocates in education and the business community. In selecting this year’s Cesar Chavez awardees, UCLR says it wanted to highlight leaders who have planted the seeds of opportunity, advocacy and civic engagement within the Latino community. UCLR will present the Cesar Chavez Peace & Justice Awards at its 25th annual awards ceremony on March 24 at the Utah Cultural Celebrations Center. Details about UCLR, the event, and awardees can be found at uclr.org and press passes will be available. UCLR's first year accepting public nominations for the Cesar Chavez Peace & Justice Awards was an incredible success! We received dozens of thoughtful and well deserving nominations. It's reaffirming to see Utah's Latino community filled with so many people and organizations working for social justice in various ways. Unfortunately, we cannot award everyone in one year and there were many that we had to pass on this year confident that they would be considered in the future. UCLR will be announcing the 2018 awardees on Monday March 5. Stay tuned! Nominations for 2018 Cesar Chavez Peace & Justice Awards Now Open! UCLR | Utah Coalition of La Raza has announced that it will now accept public nominations for its 2018 Cesar Chavez Peace & Justice Awards. 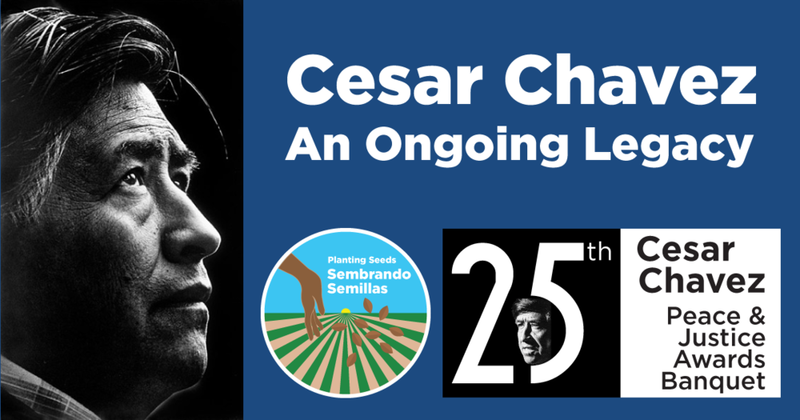 UCLR hopes community members will take the opportunity to honor those individuals or organizations that continue the legacy of Cesar Chavez in their work, advocacy and impact. Nominations will only be accepted online HERE. UPDATE: Nominations for 2018 are now closed. Now that the Trump administration has announced that DACA protections will end in 6 months, we must push Congress to pass a clean and standalone DREAM Act to ensure that our 800,000 DREAMers can continue to pursue the American Dream. 1. 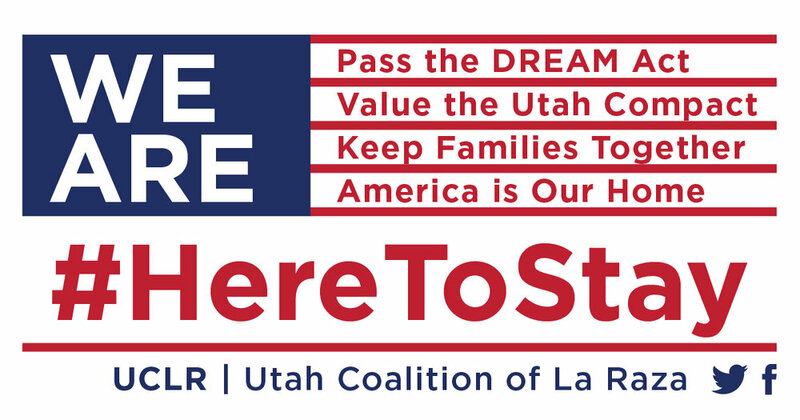 Tell Senator Orrin Hatch to co-sponsor and support a clean and standalone DREAM Act. Click HERE to sign the MoveOn petition to Hatch. 2. Tell Your Congresswoman or Congressman to support a clean and standalone DREAM Act. Note: Utah Congressional District 3 is currently vacant. 3. Tell Senator Mike Lee to support a clean and standalone DREAM Act. The main point is that you, as a constituent, want your voice heard and want the House and Senate to pass a clean and standalone DREAM Act before DACA expires. Personal stories matter. If you have a personal story to illustrate the importance of DACA to your life, your family, your business, your education, your faith, or any other meaningful way, share that story. Ending DACA threatens the life opportunities for 10,512 Utahns and 800,000 young people across the country. For many DREAMers, America is all they’ve ever known. America is their home. 73% of DACA recipients have a sibling, spouse, or child who is a U.S. citizen. Tearing them away from their family and community is morally repugnant. These young people are pursuing the American Dream (going to school, working, starting a business, buying a home) and contributing to Utah’s economy. DACA recipients account for $476.4 million in Utah’s annual GDP. DREAMers have earned the right to stay. DREAMers are innocent victims of a broken immigration system. We/They came here as children and punishing a child for the actions of their parents is simply un-American. Don’t let politics change your view of these young people. They are not line items, tokens, or liabilities; DREAMers are human beings that deserve dignity and respect. The DACA program has enjoyed the support of businesses, faith leaders, law enforcement, educational institutions, and nearly every conscionable person. More than 75% of registered voters support letting DREAMers stay or providing them a pathway to citizenship. Don’t be on the wrong side of history. We will continue to update this post with new info and new ways to support DREAMers going forward. Utah Coalition of La Raza (UCLR) released the survey responses from the six candidates seeking to become the next Salt Lake County Sheriff. UCLR surveyed candidates on issues concerning to the Latino community and other minorities. Topics included: diversity, the school-to-prison pipeline, criminal justice reform, immigration enforcement, and community relations. All candidate responses can be viewed at uclr.org/slco-sheriff.